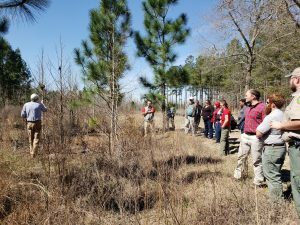 Training for participants in a program the National Bobwhite Conservation Initiative (NBCI) believes can be instrumental in landscape scale restoration of wild bobwhites kicked off recently with an initial session in Orangeburg, SC. Roll-out to each of the participating states will continue this year and next. The Natural Resources Conservation Service’s new Bobwhites in Pine Savanna program, approved at the urging of NBCI and Georgia Department of Natural Resources in late 2016, will deliver technical and financial assistance to landowners interested in restoring pine savanna habitat using native grasses, timber thinning and prescribed fire on 82,000 acres across seven states. 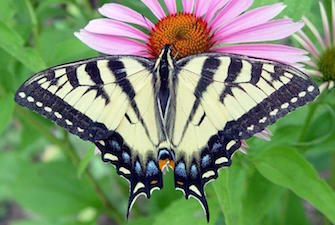 The program is part of NRCS’s Working Lands for Wildlife (WLFW) efforts and is funded under the federal Farm Bill. The in-service technical training sessions are aimed at the technical assistance providers who will work with private landowners in each state. The training provides the tools needed to manage pine forests for the diverse understory vegetation bobwhites and other species need, along with information on utilizing funding sources through the WLFW program. Orangeburg trainees included staff from the NRCS, South Carolina Department of Natural Resources, Clemson University Extension and the Longleaf Alliance. Workshop trainees will typically include personnel from NRCS, Farm Services Agency, state wildlife agencies, university extension programs, private conservation organizations, private consulting foresters and biologists, and private landowners. NBCI, in collaboration with the Warnell School of Forestry and Natural Resources/University of Georgia and the Georgia Department of Natural Resources, will conduct at least one of these workshops in each of the seven states identified in the project geography. In addition to South Carolina those states include Alabama, Florida, Georgia, New Jersey, North Carolina and Virginia. Trainers will also produce educational materials detailing management techniques and results from intentional, targeted pine savanna management for bobwhites. Judkins, who grew up on a ranch with bobwhites and has experience with prescribed fire, has worked for the Iowa Tribe of Oklahoma in stream quality monitoring, studying water quality, invertebrates and fish species before becoming a state game warden for five years. He began his new assignment on Jan. 1. 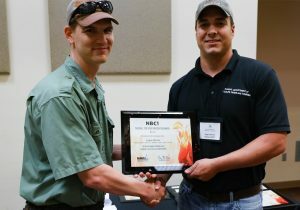 He will represent Oklahoma with the National Bobwhite Technical Committee and the National Bobwhite Conservation Initiative. Judkin’s wife, Megan, is the director of the Grey Snow Eagle House, a rehabilitation, housing and educational facility for bald and golden eagles in Perkins, OK. Judkins enjoys hunting, fishing, reloading, fossil and mushroom hunting, and leather-work and traditional native bead-work. Judkins can be contacted at tell.judkins@odwc.ok.gov or (405) 301-9945. 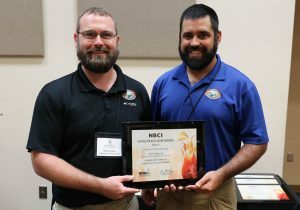 The National Bobwhite Conservation Initiative (NBCI) achieved its two top priorities in the 2018 Farm Bill — the inclusion of language encouraging USDA programs to use native vegetation, as opposed to exotic species, in its conservation programs, and an increase in the funding for Conservation Reserve Program (CRP) tree thinning and prescribed burning from $10 million in the 2014 bill to $12 million in the new bill. NBCI created the Natives First Coalition to rally support for the use of native vegetation in the Conservation Title programs of the Farm Bill, organized field tours and briefings for key Congressional staff and conducted letter-writing campaigns with coalition members. 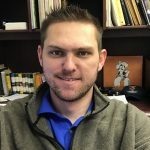 The 25-state National Bobwhite Conservation Initiative (NBCI) is welcoming Matt Lohr of Virginia as Agriculture Secretary Sonny Perdue’s choice for chief of the Natural Resources Conservation Service (NRCS). 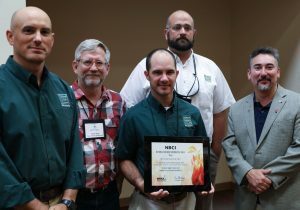 “NBCI looks forward to continuing our cooperation with NRCS and Chief Lohr to reverse the decline of the northern bobwhite, other grassland birds and pollinators that depend on native grassland habitat on farms and ranches,” said NBCI Director Don McKenzie. 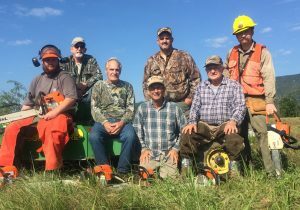 NBCI currently is working with NRCS’ Working Lands for Wildlife program that is restoring native grassland habitat for the northern bobwhite which has been declining precipitously due primarily to habitat loss. 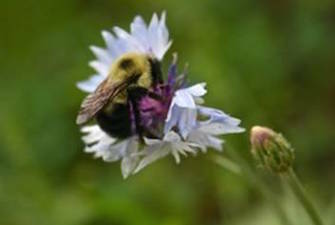 The Bobwhites in Grasslands project will affect more than 150,000 acres in 10 states, with state wildlife agencies and NRCS providing technical and financial assistance to landowners interested in converting pastures of introduced fescue to native grasses and wildflowers, along with developing prescribed grazing and burning plans. The Bobwhites in Pine Savanna project targets 82,000 acres in seven states and will provide assistance to landowners interested in restoring declining pine savanna habitat using native grasses, timber thinning and prescribed fire. 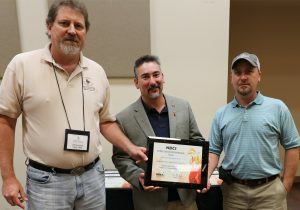 Left to right, Park Cities Quail Coalition Executive Director Jay Stine, NBCI Director Don McKenzie and Park Cities Quail Coalition committee member, Clay Huffstutter. 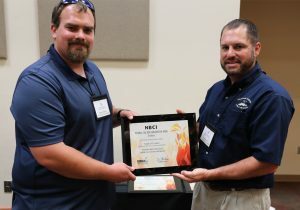 Long-time supporters of the National Bobwhite Conservation Initiative (NBCI), Park Cities Quail Coalition in Dallas, Texas, has increased its backing of the 25-state bobwhite restoration effort with the awarding of $100,000 for NBCI’s agriculture liaison position in Washington, D.C., for the next year. McKenzie said the Dallas-based conservation group’s backing is primarily responsible for NBCI’s ability to establish inroads for bobwhites with a host of federal agencies, including the Farm Service Agency and the Natural Resources Conservation Service (NRCS), the National Park Service and the U.S. Forest Service, all having positive impacts on thousands of acres of habitat restoration. 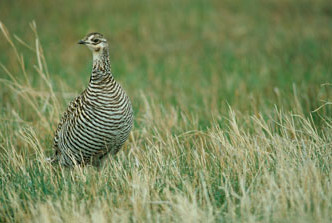 One example is the Bobwhites in Grasslands project with the NRCS, which targets over 150,000 acres in nine states, and will provide technical and financial assistance to landowners interested in converting pastures of exotic, endophyte-infected fescue to drought-tolerant native grasses and wildflowers, along with developing prescribed grazing plans. 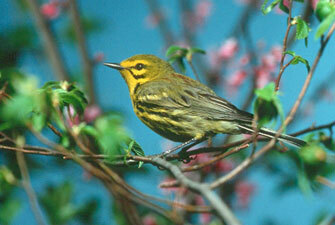 A similar bobwhite project is being implemented by NRCS on timberlands in six states. Headquartered at the University of Tennessee’s Institute of Agriculture/Department of Forestry, Wildlife and Fisheries, NBCI is a science and habitat-based initiative of the National Bobwhite Technical Committee (NBTC) to elevate bobwhite quail recovery from an individual state-by-state proposition to a coordinated, range-wide leadership endeavor to restore wild bobwhites on a landscape scale. The committee is comprised of representatives of 25 state wildlife agencies, various academic research institutions and private conservation organizations. 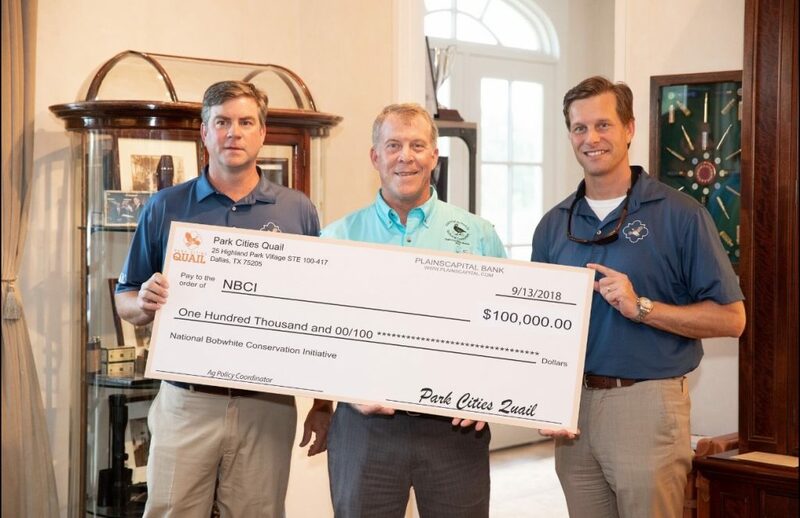 Support for NBCI is provided by the Federal Aid in Wildlife Restoration Program, state wildlife agencies, the Joe Crafton Family Endowment for Quail Initiatives, the University of Tennessee, Quail & Upland Game Alliance, Park Cities Quail Coalition and Roundstone Native Seed. Park Cities Quail (PCQ) is a 501(c)3 non-profit organization run by a group of Dallas area volunteers who are passionate about their sporting tradition and are determined to make it available to future generations. By being completely volunteer, we are able to donate virtually 100% of every dollar raised towards quail research and youth education. In the past eleven years this group of individuals has raised and donated over $8,600,000 directly to the cause! PCQ also spawned Quail Coalition, a statewide organization which now boasts 12 chapters and over 4,000 members. www.quailcoalition.org. 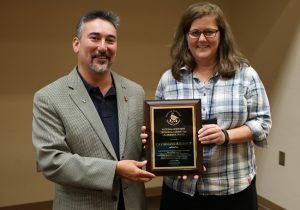 Catherine Rideout, the official liaison between the National Bobwhite Technical Committee (NBTC) and Partners in Flight (PIF) since 2012 (the longest serving non-quail conservation organization representative in NBTC Steering Committee history) received the 2018 NBTC Leadership Award during the NBTC annual meeting in Albany, GA, recently. 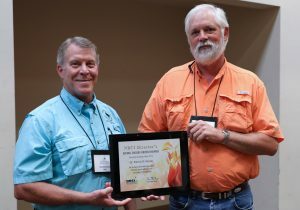 The 2018 National Bobwhite Technical Committee (NBTC) Group Achievement Award recognized the leaders of the 2017 Joint Quail Conference (JQC), in Knoxville, Tennessee, July 24-28, 2017. 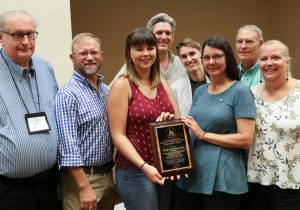 Committee members spent two years leading and implementing the largest gathering of professional quail biologists­—242 registrants—in more than a decade, providing a tremendous opportunity for communication between managers and researchers. 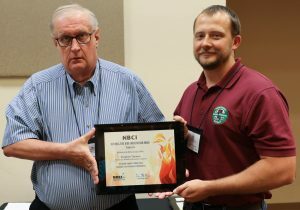 The JQC also provided four products with national impact: the 23rd Annual National Bobwhite Technical Committee meeting; the 8th National Quail Symposium; Proceedings of the 8th National Quail Symposium; and the launch of the new e-journal, NBCI National Quail Symposium Proceedings. Committee members included Roger Applegate, Furbearer/Small Game/Wildlife Health program leader, Tennessee Wildlife Resources Agency (TWRA); Penny Barnhart, accounting specialist, NBCI; Dr. Thomas Dailey, science coordinator and assistant director, NBCI; Andy Edwards, regional biologist, Quail Forever; Beth Emmerich, resource scientist, Missouri Department of Conservation, and chair of the NBTC Science Subcommittee; Molly Foley, data analyst, NBCI; Alyssa Merka, communications specialist, NBCI; Dr. Kelly Reyna, director of Sustainable Agriculture and assistant professor of Wildlife Management, Texas A&M – Commerce, and vice chair of the NBTC Science Subcommittee and academic representative on the NBTC Steering Committee; and Timothy White, wildlife biologist, TWRA. The National Bobwhite Conservation Initiative will present a webinar at 1 p.m. (EDT) July 25 on how to use the CP33 – Habitat Buffers for Upland Birds, a practice in the Conservation Reserve Program, to create and maintain nesting and brooding habitat for quail and other grassland birds on less productive cropland field margins. Northern bobwhite quail and many other grassland bird species have experienced significant population declines over the last several decades and the loss of native grassland habitat is one of the primary causes of these declines. The CP33 buffer practice can help maintain important native grassland habitat within an agricultural landscape. This webinar will discuss the CP33 practice requirements, their importance on the landscape and how best to establish, manage and maintain the habitat quality for quail and grassland birds. 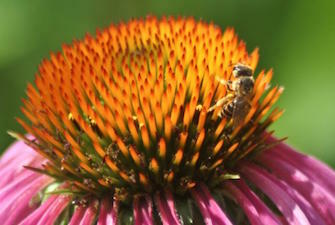 Webinar presenter will be Lisa Potter, the private land programs supervisor with the Missouri Department of Conservation. She received a B.S. 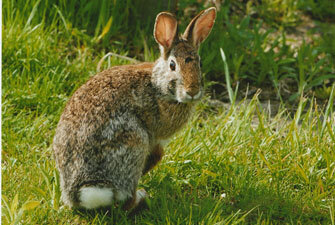 in Wildlife Biology from Kansas State University and a M.S. 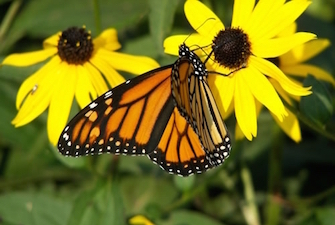 in Ecology and Evolutionary Biology from Iowa State University. Prior to her current role, Lisa had the opportunity to work directly with private landowners to assist them in achieving their wildlife habitat objectives. She continues to work on policy development and implementation of state and federal conservation programs in the continued effort to maintain wildlife habitat on private lands. 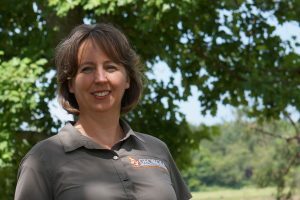 Potter has been a member of the National Bobwhite Technical Committee since 2003 and currently serves as chair of the Agriculture Policy Subcommittee. The webinar will be available at http://www.forestrywebinars.net/webinars/maintaining-quail-and-grassland-bird-habitat-in-the-agricultural-landscape-cp33-habitat-buffers-for-upland-birds. Continuing education credits are expected to be available for a variety of natural resource professionals. 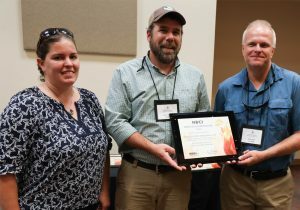 Dallas R. Ingram, a seven-year veteran of the Bobwhite Quai Initiative in the Georgia Department of Natural Resources’ private lands program, has been named Georgia’s new state quail biologist. Ingram has a MS in biology from Valdosta State University, a BS in Fisheries and Wildlife from the University of Georgia’s Warnell School of Forest Resources and an AS in biology from Abraham Baldwin Agriculture College.